Bandeoke, or Rockaoke, is one great way to have an absolutely unforgettable party, the opportunity to get stuck in and sing with a professional live band! 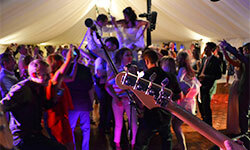 One way to have an absolutely unforgettable party is to get stuck in and sing with a professional live band ! You just can not compare singing with a karaoke machine to singing with a professional live band. Singing with a pro live band gives you the ultimate party experience, the energy, excitement and fun is on a completely different level. And as a fun professional band we know how to get the audience moving and involved. Bandioke takes things another step forward. You and your friends can be the stars of your party, rock gods or funky soul divas for the night ! But who are we? Milo Max is a full-time professional function band and we thrive on creating an energetic and fun experience for you, our clients. Milo Max personnel have performed many private engagements for individuals including celebrities, corporate gigs, festivals, and on TV and Radio. For the last decade we have performed over 1400 events and have shown our clients a cracking time; we hope we have the opportunity to do that for you too! Milo's Bandeoke Show OR The Bandeoke Experience? Milo's Bandeoke Show has more of a split between a standard party dance set and bandeoke. This can be more suitable for weddings and other gatherings were you have a more disparate audience and want to make sure you appeal to everyone with a live set geared towards dancing and a bandeoke set, where the audience comes up to sing with the band. If you are looking for a full night of interactive bandeoke show you may prefer our sister band's service 'The Bandeoke Experience'. This is better suited for parties where most if not all people already know each other and you are confident folks will participate, staff parties for example. 100% audience engaging show with fantastic repertoire! Dedicated Bandeoke kit (inc wireless mics, lyric screen & laptop)! Great client care from enquiry through to show time! Book Milo Max's Bandeoke Service today! Don’t miss out on booking us for your event – Contact Us today for a quick chat about how our Bandeoke Show could work for your party, for pricing and availability and to find out how we can provide you with a tailored and highly-memorable experience. I just wanted to say a big thank you to the band on our wedding day. You guys were awesome! Everyone loved the Bandeoke! Dan - thanks for lending me your guitar off the cuff, Wonderwall went down a storm with the northern guests and it meant a lot to my brother (best man). Thanks again! I thought all communications and info on the website was professional, informative and friendly and Ross was always on the end of email or phone if needed; communications with the band on the day were excellent. Your singer was really good at helping anyone get their pitch or if they lost their place in lyrics at all. I also think they didn’t force the pace - they split up the sets so that people built up confidence and could really enjoy themselves - my husband had the absolute best night! Perfect 40th party. "The quality of the musicianship was excellent!" Everyone had a fantastic night and we've had loads of positive feedback from the guests, a couple of whom have expressed an interest in future bookings for weddings and corporate events. The quality of the musicianship was excellent! We would not hesitate to recommend you. Many thanks. I can honestly say that the 16th September was the best day of my life and I will forever have those special memories in my heart. We wanted to thank you and your fantastic band for what was the perfect day for us both, and all our family and guests commented on how amazing you were, so hats off to you and your band!